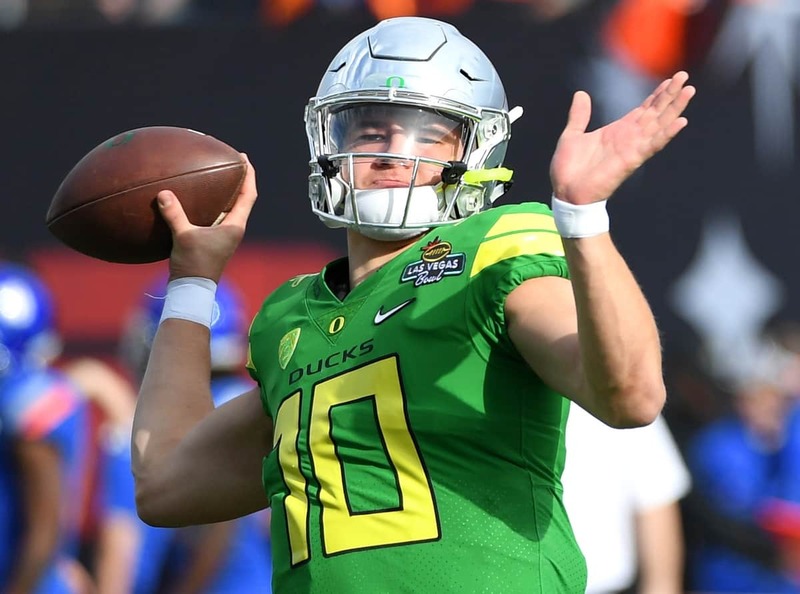 Oregon quarterback Justin Herbert is widely seen as one of the best quarterbacks who could be available when the 2019 NFL Draft kicks off next April. Many believe he’s absolutely the best quarterback for that class, if he decides to come out (he’s rumored to be angling for one more year). On Saturday as his Ducks hosted the best team in the Pac-12, the Washington Huskies, Herbert demonstrated exactly why NFL scouts are drooling over his pro potential. Check out his elusiveness and ability to drop a dime under pressure. Here’s another look at the same throw from a different angle that really highlights the ridiculous accuracy on this pass. Herbert has everything NFL teams look for in a franchise quarterback. At 6-foot-6 and 233 pounds, he has plenty of size. He’s extremely athletic, and obviously he has an NFL arm. With that in mind, don’t be surprised if Herbert ends up going No. 1 overall, either in 2019 or 2020.